On Monday, July 18, 2016 at approximately 3:47 PM, the Fountain Valley Police Department responded to 16192 Harbor Boulevard, Bank of America, regarding a bank robbery that had just occurred. The suspect entered the bank and approached a teller. The suspect grabbed a hold of the teller’s hand and demanded money. The teller complied and handed the suspect cash at which time he exited the bank. As the suspect fled on foot he said he had a bomb in his backpack, which was left inside the bank. The bank was evacuated and the Orange County Sheriff’s Bomb Squad was requested to render the backpack safe. No explosives were located in the backpack. Fountain Valley Detectives received a tip which led to the identity of the suspect. Detectives, working alongside the FBI, located the suspect at a motel in Santa Ana. On July 20th the suspect was taken into custody without incident as he exited the motel room. 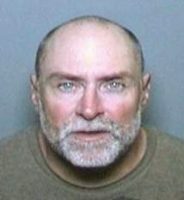 The suspect was identified as Scott Martin Richetts, 50 years of age, from Santa Ana. During an interview, Richetts admitted to the robbery and was subsequently booked at the Orange County Jail for robbery, making a bomb threat, and a probation violation. His bail was set at $50,000.00.